Some say this restaurateur with the audacious run in Traverse City’s food biz is fearless. He doesn’t see it that way. Meet Simon Joseph, the man behind the mini-empire spawned by the food truck Roaming Harvest. This story is featured in the March 2018 issue of Traverse, Northern Michigan’s Magazine. Get your copy! Fearless—about the restaurant business anyway—seemed to fit from what little I knew of Joseph based on casual observation of his nearly audacious run in Traverse City’s food scene. 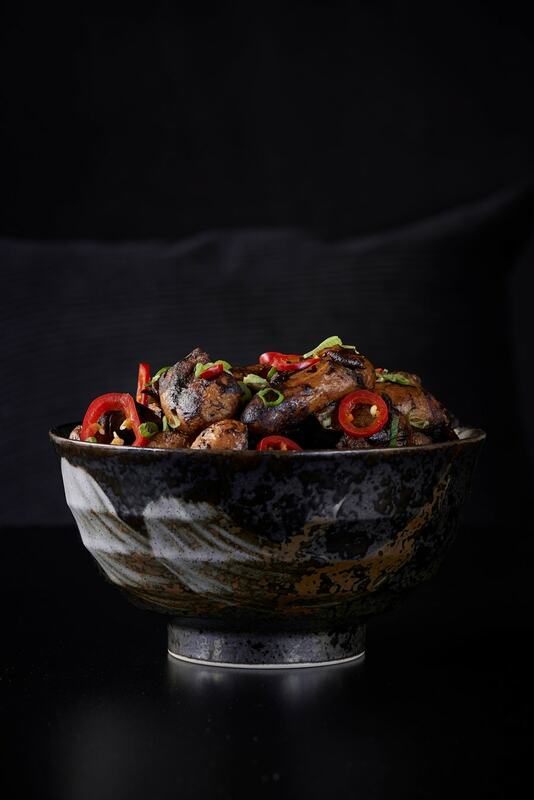 In 2012 he opened TC’s first high-profile food truck, Roaming Harvest, a Latin-Asian-multi-ethnic concept (Korean Beef Tacos, Kung Pao Brussels Sprouts, that sort of thing) that built an instant fan base. He then led the initiative to pass a food truck ordinance—paving the way for himself and, of all things, competitors, and helped ignite food truck dreams all over the north. In June 2014 Joseph opened Harvest restaurant, a brick-and-mortar iteration of his food truck. 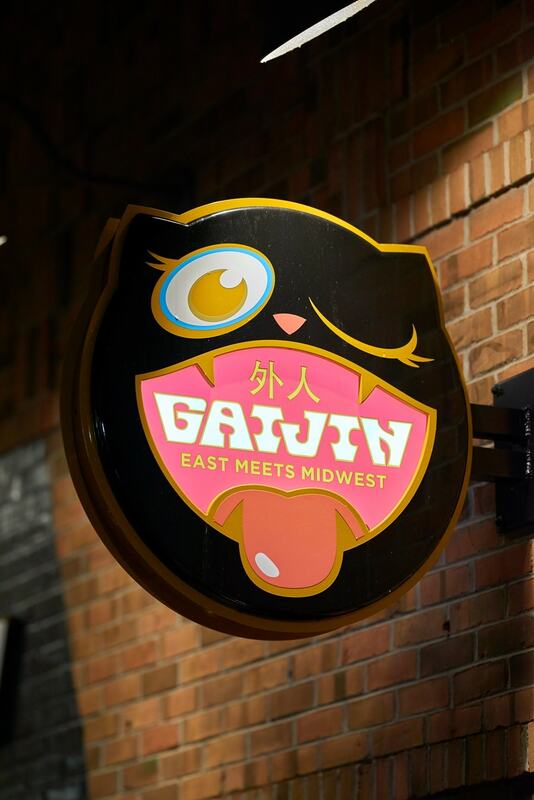 Then in June 2016 he unveiled Traverse City’s first ramen shop, Gaijin. 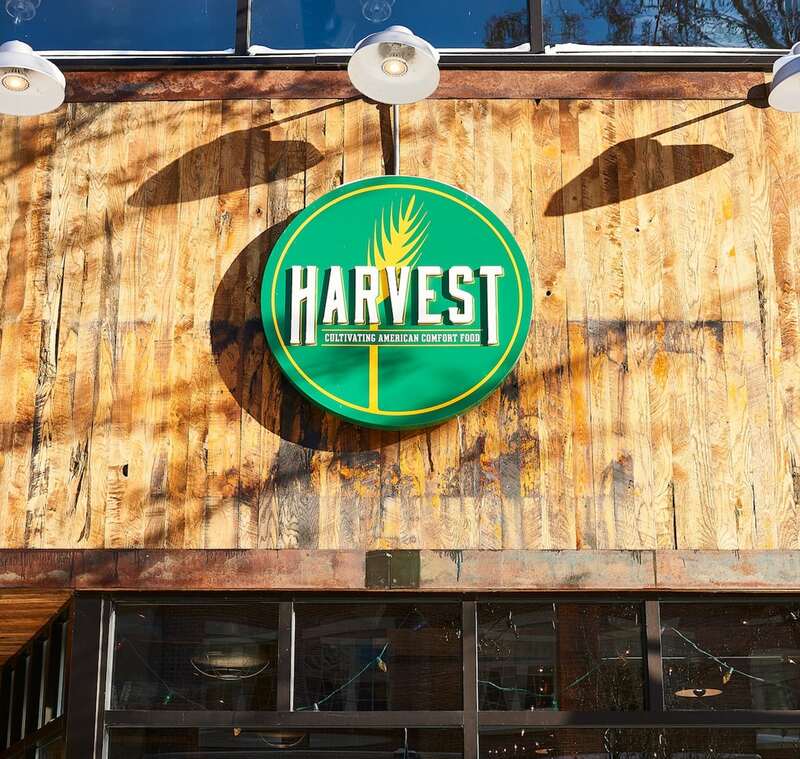 About a year later, he moved Harvest to bigger digs on Union Street and turned the original Harvest space into Alley’s, a market and pizza place specializing in Detroit-style pizza pies. 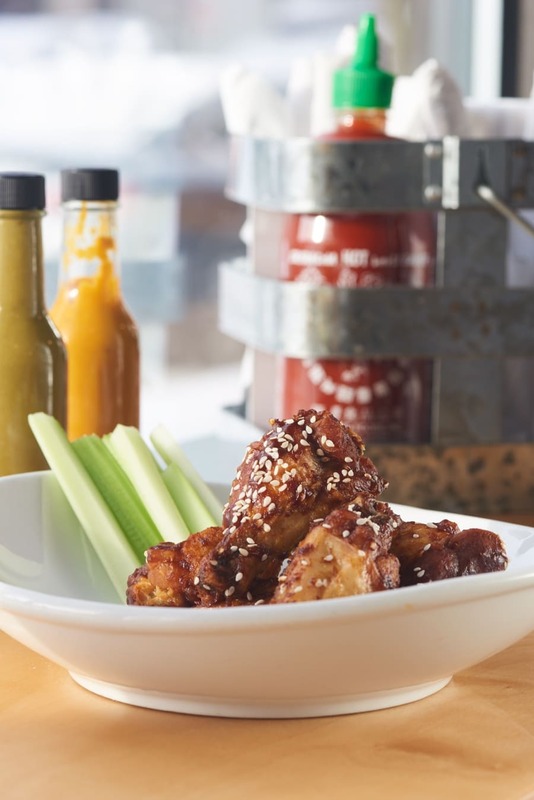 Assuming you got lost in all that, basically Joseph opened nearly one new venue a year during each of his first five years in what’s considered by many to be one of the Midwest’s most crowded and highly competitive restaurant markets. Each of Joseph’s venues was inventive, smart, delivered high quality. Each had an ephemeral element of fun and sharp surprise that satisfied both the intellect and the soul. And what I hadn’t even known about was the expensive imported Japanese ramen noodle machine that might be the foundation of the next venture: selling TC-made ramen at retail. On a morning in early November I walk through a windowless brown metal door that has Suite 104 Gaijin Ramen stenciled on it to find Joseph alone in what he calls “the noodle factory.” He typically makes ramen alone, but the room is 25 by 40 feet with a 12-foot ceiling, and Joseph and the ramen machine take up such a small space that it feels like a one-man act on a way-too-large, very bright stage. Joseph’s favorite podcast, “How I Built This,” plays from a speaker. It’s a show about the trials and tribulations of entrepreneurs. Joseph concedes he is something of a science nerd, and it’s on display this morning. He’s standing at a counter with Pyrex beakers and Pyrex stirrers and a digital scale. He’d look like a scientist if not for the brown Bolshevik-style billed cap, gray Roaming Harvest T-shirt (slogan: Eat standing up) and jeans. He’s in the midst of weighing potassium carbonate and adding the white powder carefully to the beaker of filtered water. “Potassium carbonate doesn’t like to go into solution, so you really have to stir it,” he says. And so he does. Stir, stir, stir, stir, stir, stir, stir … the glass stir-stick clinks rapidly against the beaker wall. He’s staring at the swirling suspension, eyes peering from below his trademark cap. He’s focused, intent, waiting for the white flecks to dissolve and disappear. “Ramen was originally a Chinese noodle,” he says, glancing up, but still stirring the potassium carbonate. “And where they originally made it, the lake where they got the water had naturally high concentrations of alkaline salts, which made the noodles really bouncy and gave this interesting texture.” When the potassium carbonate finally dissolves, he pauses to turn off the podcast, and explains that the potassium carbonate also reacts with the high-gluten flour to give it the yellowish color. Japan’s love affair with ramen started after World War II, when American high-gluten wheat was imported to the country. “The Japanese really liked that texture part. 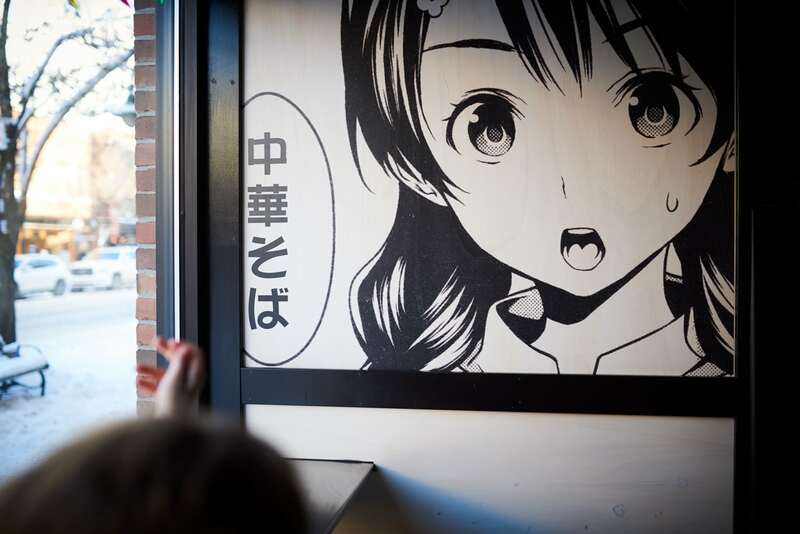 The high gluten noodle was even more slippery and bouncy and there were lots of interesting things about eating a ramen bowl, more than just the flavor,” he says. The soft egg, the bouncy noodles, the hot broth, “the real unctuous pork.” (Unctuous: smooth and greasy in texture and appearance.) In Japanese culture, food texture, mouthfeel, is very important, he explains. By now Joseph is sifting flour into the ramen machine’s hopper, and the sound of the sifter—sift, sift, sift, sift, sift, sift, sift whispers through the noodle factory space, the locally grown, locally milled wheat becomes a white rain into the mix. The ramen machine doesn’t extrude the noodles (that is, it doesn’t push the dough through little holes to make a noodle). Instead, the machine creates a flattened sheet of dough and then cuts the dough with a finely machined cutting dye. “But I noticed that one of the blades got a tiny nick in it somehow,” Joseph says. He shows me a set of cutters sitting on a shelf, and we zero in on it to scrutinize the microscopic chink. “It was leaving a little nick in the noodle,” he says. So Joseph is a self-professed science nerd. But by the time he’s done with the noodle lesson, I realize he’s also into history and also culture and he knows how to correctly use the word “unctuous,” and he’s a DIY guy. In short, Joseph is doing his research, keeping an eye on the quality and paying attention to the details. The ramen machine was expensive—he asks me not to publish the price—but if he were buying high-quality, fresh ramen, the cost would have been $2 per-serving at Gaijin. With the machine, he can cut that unit price to 35 cents. “You can see it pays for itself pretty quickly,” he says, as the first sheet of dough comes out of the machine. He’s contemplating using the machine to make ramen to sell in stores. Simon Joseph grew up on the shore of Lake Michigan in Onekama. He was from a Polish family, so he was raised with homemade cooking and a diet of the classics: kielbasa, sauerkraut, pierogis, golumpki and paczki. “My great-grandma would go to the church in Manistee to make paczki with the nuns,” he says. But when Joseph got married, he and his wife, Rebecca Brown, were on opposite schedules. He tired of missing birthday celebrations, holidays, and date nights, so he changed careers, opting for construction. 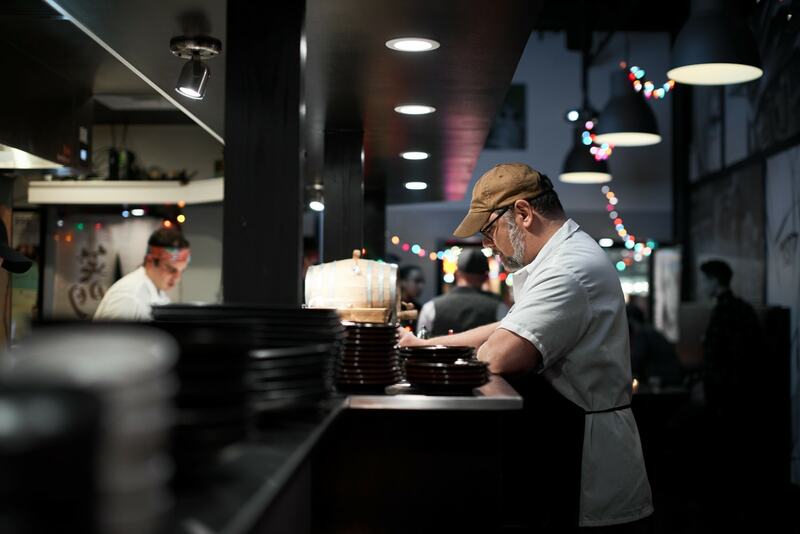 He loved construction for its attention to detail, the use of geometry, the satisfaction of building something like a house, but he missed the adrenaline of the food biz, the urgency, the crush of an insane night in the kitchen. And, he discovered that he’s a hospitality guy at heart. He missed that too. “I’m the guy at the party who’s in the kitchen all night and then doing dishes at the end when the party’s over,” he says. 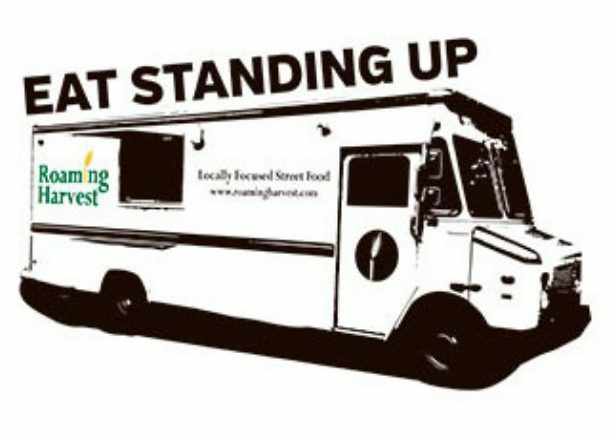 In 2009 he started thinking about a food truck, noticing that there were none in Traverse City. “I researched and researched it,” he says. “Basically that means a lot of web surfing.” And with the help of his CPA—and now business partner—wife, he put together a business plan. He found a rig for $3,500 in Grand Rapids, a retired delivery truck for a linen company, and put his construction skills to good use installing the kitchen. Back in 2012, the first place he parked Roaming Harvest was by Munson hospital, at the corner of Elmwood and 7th Street. He put the word out on social media, let people know he was ready to sell his first Korean Beef Taco. “We opened the window and somebody was standing there, and I was like, holy s**t! This is gonna work!” he says. He laughs, like he can still barely believe it. Fast forward five-and-a-half years from that opening day to early winter 2017. It’s 9 a.m., and Joseph is sitting in a booth in Gaijin. The ramen shop doesn’t open for a couple of hours, so it’s quiet except for the occasional clank of a pan lid or sound of a walk-in cooler door opening and closing as the prep cook does his work. The moment seems right to reflect on how far and how fast Joseph has traveled since that first food truck taco. Is fearlessness the magic fuel? “People say I’m fearless, but I don’t really see it that way,” he says. “I think of it more like I see opportunity and I pursue it,” he says. He, in fact, denies that being focused on fear or even being focused on money, is helpful. Jeff Smith is editor of Traverse. smith@traversemagazine.com. 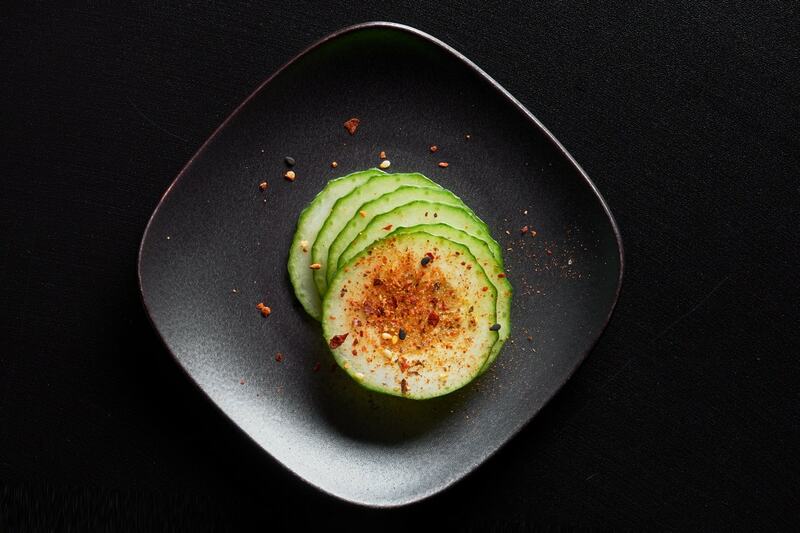 // Jon-Paul Allgaier photographs lifestyle, food, product and weddings from his base in Traverse City. greyscalegroup.net. Mix ingredients well, keep refrigerated.